Ninety (90) daily prizes ("Daily Prizes") will be awarded in this Sweepstakes to ninety (90) Prize Winners. The Daily Prize shall consist of 1 $25 Fandango Gift Card. The ("ARV") of each Daily Prize is twenty-five Dollars ($25). One (1) grand prize ("Grand Prize") will be awarded in this Sweepstakes to one (1) Grand Prize Winner. 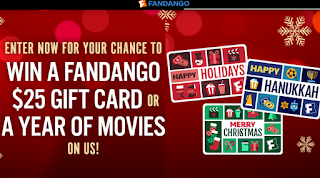 The Grand Prize shall consist of twenty-four (24) $25 Fandango Gift Cards. The ("ARV") of the Grand Prize is $600 hundred Dollars ($600). The ARV of all Prizes is two thousand eight hundred fifty Dollars ($2,850).